Walkie-talkies are known to have a wide range of uses for both professional and recreational use, and the current market is exploding with new products geared specifically towards children. These walkie-talkies, which generally have simpler designs and are built for durability, are not only fun to play with but also help parents stay connected with their kids. So, what makes a walkie-talkie for kids different from those marketed for adults? With all of the options out there, how do you know what features to consider when purchasing one for your children? We took the guess work out of this decision for you by reviewing a few of the best walkie-talkies for kids and giving you a breakdown of the features and considerations you need to make an informed purchase. Long lasting, easy to use and friendly for children. 2 mile range and 3 separate channels for operation. 22 channels of both FRS and GMRS frequency. Light and durable, weighing in at 90 grams. Includes an LCD display, built in flashlight and call alert signals. Range: 3-5 km, crystal clear & reliable communication. Available in kid-friendly colors & weighs only 79 grams. Auto squelch function: Mutes background noise for clear communication. 2 miles range and 22 channels. Click-and-hold communication button with basic volume controls. Push-to-talk button & back-lit LCD display. Range of up to 3 km & Auto squelch function. Great sound quality and 3 hours of continuous operation. There are many amazing walkie-talkies for children available on the market. If you are looking for some good radios then read on as we discuss in detail the features of some of the best kids walkie-talkies that are currently available. 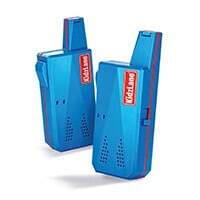 Certainly a candidate for the best kids walkie-talkie are the Kidzlane durable walkie-talkies. They are not only long lasting but also easy to use and friendly for children. Everything from their lightweight, compact bodies to their colorful exterior has been designed to appeal to children. These walkie-talkies have a user friendly push-to-talk operation and LED indicators. They can even be clipped to a belt so that your child doesn’t lose it while playing. Perfect for using both indoors and outdoors, the Kidzlane walkie-talkies have a good range and provide clear communication, even in crowded places like theme parks. The battery life on these devices is pretty impressive as well, and allows your child to enjoy almost 3.5 hours of continuous use. These walkie-talkies will make an excellent gift for you child. The Retevis RT628 is an excellent choice for a child’s walkie-talkie, and it offers a variety of features that elevate it to more than just a toy. This Retevis walkie-talkie has several design features that set it apart on the market. The RT628 is equipped with 22 channels of both FRS and GMRS frequency, which cuts down drastically on outside interference when communicating, making children’s games with their friends that much more exciting. The RT628 is light and durable, weighing in at 90 grams, and it has an intuitive set of controls that are easy for a child to learn and operate. Additional features of the RT628 include an LCD display, built in flashlight, and call alert signals. The Zomei T388 is a compact, lightweight walkie-talkie perfect for little hands and hours of play. Coming in a range of kid-friendly colors including pink, yellow, and blue, these walkie-talkies appeal to kids and make them easy to spot if misplaced. The T388 weighs in at only 79 grams, making it extremely lightweight and easy for a young child to carry with the included belt clip. The range of the T388 exceeds the competition with an advertised range of 3-5km (approximately 2-3miles) ensuring crystal clear, reliable communication. In addition to the adjustable volume control, the Zomei T388 features an auto squelch function which can be used to mute background noise for clearer communication. Ideal for use at theme parks and large public events, this feature helps parents feel reassured that no matter what the conditions, they will be able to communicate with their child. Similar to the Retevis walkie-talkie earlier reviewed, the Zomei T388 also has a 22 channel FRS/GMRS system and a one-click scan feature on the backlit LCD screen, which allows the user to quickly and easily find an open channel. An all-around high testing product, the Zomei T388 is built for durability and is sure to stand up to hours of summertime fun! The Spy Gear brand produces a variety of gadgets and products perfect for your little secret agent. 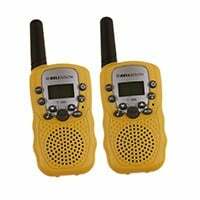 Appealing to a kid’s sense of adventure, they can take these compact design walkie-talkies with them whether they are playing with neighborhood friends or on a top secret mission. Standout features of the Spy gear walkie-talkies are the simplicity of design and longer range capability than competing children’s products. With typical terrain, these walkie-talkies can be used for communication up to 2 miles (3.2 km) away. This range capability makes these walkie-talkies a perfect means of communication when at large events such as theme parks, festivals, and sporting events to ensure your children’s safety. Using a standard click and hold communication button with basic volume controls, these walkie-talkies are easy for children to use and operate and are recommended for those ages 6 and up. 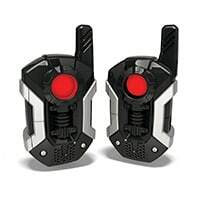 These Spy Gear walkie-talkies would make an amazing gift for your child. If you want a good walkie-talkie for your children then you should check out the 7TECH Kids Walkie-Talkie. These devices are not only small and compact in style but they are also easy to use for children. Perfect for ages 6 and up, these devices have simple push-to-talk button operation and a back-lit LCD display which is simple enough to be used by kids. The 7TECH walkie-talkies have a loud and clear sound quality and provide a range of up to 3km, so that your children can communicate over a large distance with ease. Included in the package are 3 AAA batteries so that your child can enjoy using this device for more than three hours continuously. With all these amazing features and more, the 7TECH Kids Walkie-Talkie will make a perfect gift for your little one. With all of the new technology exploding the market and very young children having access to sophisticated means of communication, why should a parent look to the walkie-talkie as a viable communication tool? Without the added worry of media influence, texting, and questionable apps, the walkie-talkie is the perfect solution to provide children as young as 5 with a fun and entertaining toy, as well as a viable means of communication for their parents’ peace of mind. With advances in durability and smaller, compact design, the market for child-friendly walkie-talkies continues to evolve and expand. Now that you’ve decided to get your child a walkie-talkie, how do you know what to look for? There are several design elements that are key when making a decision for the product that’s right for you, and it all depends on what you plan on using it for. It’s no secret that kids are hard on their toys. A walkie-talkie is the perfect tool for imaginative play, both inside and outdoors, and there is no doubt that it will be dropped, stepped on, and otherwise well-loved. 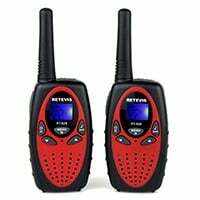 The first thing that parents generally look for when researching walkie-talkies is how well they will stand up to the everyday rough and tumble play that children will put them through. Luckily, the growing market continues to produce products with this exact concern in mind! All of the walkie-talkies we reviewed made a point of marketing the durability of their product. ​After the ability to handle the rough play of childhood, the next thing parents want to know is how long the batteries will last! While the walkie-talkies we reviewed in this guide take standard AA or AAA batteries, advances in technology allow them to still have impressive numbers on their battery life. Although models vary, research into reviews of basic child-friendly walkie-talkies set the battery life at around 3 hours of continuous talk or 9 hours of active time (unit is on but not in continuous use). The range of a walkie-talkie is a big variable when looking at different models, and the distance it can cover varies with the terrain and capabilities of the specific device. The kid’s walkie-talkies that we reviewed range in coverage from 2000 feet up to approximately 3 miles. When deciding on a model that will work best for your family, the main consideration for parents is how they plan on their children using the walkie-talkie. Will your child be playing﻿﻿ out in your yard with friends? Do you need it for safety reasons at large public venues such as theme parks? Will your child want to talk with their best friend that lives at the end of the street? All of these questions need to be taken into consideration when deciding what distance range you are comfortable with when purchasing the walkie-talkie. Despite the claims of producers, it’s important for the parents to keep in mind the terrain that the walkie-talkies will be used in. You are bound to get a much clearer signal if you are communicating with your child across a wide open space, such as a park or a fairground, than when hiking through hilly terrain or communicating from house to house over a large distance. Overall, based on consumer reviews of the bestselling kid’s walkie-talkies, the average distance range that still provided a clear, uninterrupted signal was around 1-1.5 miles for the typical walkie-talkie. There are many features to take into consideration when purchasing a walkie-talkie for your child. While most parents are looking for a strictly recreational toy for their kids to have fun with their friends, there are wider reaching influences to take into consideration. It is important to research the products that offer the features that are most important to your family, such as battery life, durability, and range. By comparing the different capabilities of the walkie-talkies marketed for children, you can find a product that not only provides hours of fun for your child but will also give you peace of mind for their safety.